An unknown person in the House of Representatives publicly leaked personal information of Republican Sens. Lindsey Graham (S.C.), Mike Lee (Utah), and Orrin Hatch (Utah) on Thursday. Each of the targeted senators is a member of the Senate Judiciary Committee, which questioned Supreme Court nominee Brett Kavanaugh and Chistine Blasey Ford, a woman alleging he sexually assaulted her in the early 1980s, in a day-long hearing yesterday. The information, which included home addresses and phone numbers, was posted on the senators' Wikipedia pages, according to Fox News. The information has been removed. The home addresses seem to have been accurate, while most of the phone numbers were either disconnected or went to voicemail. "It’s shocking that someone would post Senator Hatch and other Judiciary Committee Republican’s home addresses online, putting their families at risk," said Matt Whitlock, Hatch’s spokesman. White House spokesman Raj Shah called the leaked information "outrageous" on Twitter. The edits were first noticed by Twitter bot @Congress-Edits, which keeps track of all of the edits made to Wikipedia from IP addresses associated with the U.S. Congress. It is unlikely anyone responsible for the leak will be caught given the anonymous nature of the edits. Anyone using a device connected to the network could have made the edits. The Senate Judiciary Committee heard testimony on Thursday from Ford and Kavanaugh. Ford told the committee Kavanaugh assaulted her at a high school party while drunk in the early 1980s, a claim the nominee denied vigorously during hist testimony later in the day. 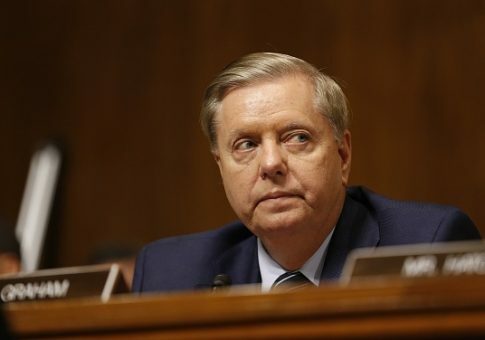 Graham spoke out angrily against Democrats' handling of Kavanaugh's confirmation process. "What you want to do is destroy this guy's life, hold this seat open and hope you win in 2020! You said that, not me!" Graham said. "This is the most unethical sham since I've been in politics, and if you really wanted to know the truth, you sure as hell wouldn't have done what you've done to this guy," he added later. The prosecutor hired by Republicans on the committee to question Ford on Thursday privately told GOP senators afterward that based on the evidence associated with Ford's allegations, she would not have prosecuted Kavanaugh or even have been able to obtain a search warrant. This entry was posted in Politics and tagged Brett Kavanaugh, Christine Blasey Ford, Lindsey Graham, Mike Lee, Orrin Hatch. Bookmark the permalink.